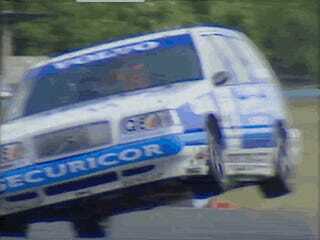 Twenty years have passed since Volvo entered two 850 wagons in the British Touring Car Championship. To this day it is still one of the bravest, nuttiest, and awesome cars. Why? Because racing wagon. When I signed up for Volvo and TWR around Christmas 1993, I didn't know about the estate plans. If I'd known, I would probably have hesitated, so it was lucky I didn't know! We hadn't had time to test the car on the track before its launch at Thruxton on 4 April. Jan Lammers and I had been able to drive a few hundred meters at the entrance to TWR's development workshop, but that was all! The Volvo 850 estate was by far the largest car in the series. Our competitors, who were taking part largely to strengthen their sporting image, were not pleased about having to compete with an estate. There were a few taunts from other drivers – but that was no problem. To wind them up, in one heat we drove with a large stuffed collie in the boot during the parade lap! While aerodynamically superior to the saloon, a large estate is not an ideal track car due to having a lot of weight behind the rear axle and a higher centre of gravity, but Volvo wanted to get as much attention as possible, and with two wheels in the air in most corners, success was guaranteed. The racing 850s used a five-cylinder naturally aspirated 2-liter engine producing around 290 hp that went through a six-speed sequential transmission instead of the standard 2.3 turbo's five-speed manual. They also had catalytic converter which only become mandatory later on. Rickard Rydell came in third place overall in 1995 and 1996, driving sedans. The 850 wagon only got the first season to prove itself because the 1995 introduction of an additional spoiler at the rear had no benefit on a wagon. The 850's racing career ended in 1997 when Volvo changed to the S40, winning the entire series in 1998.